Geomorphologists who study Earth's surface features and the processes that formed them have long been interested in how floods, in particular catastrophic outbursts that occur when a glacial lake ice dam bursts, for example, can change a planet's surface, not only on Earth but on Mars. Now geoscience researchers Isaac Larsen at the University of Massachusetts Amherst and Michael Lamb at the California Institute of Technology have proposed and tested a new model of canyon-forming floods which suggests that deep canyons can be formed in bedrock by significantly less water than previously thought. They point out that "reconstructing the magnitude of the canyon-forming floods is essential for understanding how floods modify planetary surfaces, the hydrology of early Mars, and abrupt climate change." 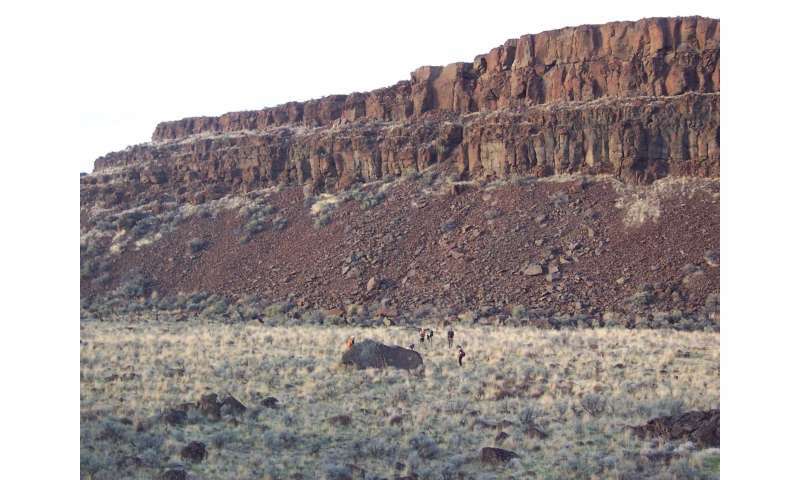 Larsen and Lamb apply their new model to the "channeled scablands" in eastern Washington State, an area that, like some on Mars, has very deep canyons cut into fractured basalt bedrock. The researchers say their results suggest "there may be a rich imprint of both the history and discharge of flooding in the morphology of canyons" such as terraces, valley shapes and slope profiles on Earth and on Mars "that warrant further investigation." Details appear in the current issue of Nature. The researchers say channels in the scablands today, which are up to 650 feet (200 meters) deep and 3 miles (5 km) wide, were likely formed by flood discharges five- to tenfold smaller than brimful estimates, that is by "significantly lower megaflood discharges than previously thought. The channeled scablands are a classic landscape in the history of geomorphology and we're bringing new views of how it was formed." Until the 1920s, scientists did not understand what could have formed the tortured landscape of eastern Washington studied for decades by J Harlen Bretz, a giant figure in geosciences, Larsen recalls. Bretz was the first to suggest that they were formed by catastrophic flooding of unknown origin. His views were dismissed for years, but Bretz was later vindicated when glacial Lake Missoula was identified as the floodwater source. As most scientists came to accept the catastrophic flood explanation for the canyons and then tried to estimate floodwater discharges, they assumed that floods filled canyons to the brim, a huge amount of water. But an alternate hypothesis proposed and now tested by Lamb and and Larsen posits that as floodwater cuts into bedrock, the canyon deepens, meaning less water is required to shape it. In areas underlain by fractured bedrock, Larsen says, "our general concept is that the channel floor was being cut and lowered as the floods were happening, and you need to account for that when reconstructing the scenario of flood magnitude. This applies to the scablands, to Mars and other areas where there have been catastrophic outburst floods." He and Lamb combine numerical flood models with estimates of the force required to erode basalt bedrock to show that for Moses Coulee, a canyon carved by catastrophic Lake Missoula floods in eastern Washington when an ice dam repeatedly broke and reformed around 15,000 years ago, their "threshold shear stress model" explains the shape and depth of currently observed channels better than the brimful model. "We numerically routed floods through the canyon in different states, from current configuration and at four different past scenarios," Larsen notes. "We predicted the discharge from two models and tested which one is most reasonable, based on the depositional evidence from the current bars seen today in the canyons. The size of floods our model predicts from the basalt erosion better match locations of depositional flood bars in the canyon than the brimful model predicts." Larsen and Lamb's new model also works better to explain observed canyon-cutting mechanics and outflow channels observed on Mars, they point out, "supporting the notion of a multi-flood or low-magnitude flood origin for the Mars outflow channels. " Larsen adds, "There are very similar but larger canyons on the surface of Mars. These outflow channels are much bigger than the ones on Earth, but they look very similar and the assumption is they formed by similar processes. We know in most cases there were not canyons before these floods happened. They had to be carved, so the bottoms were getting lower and lower with each flood. We believe in the final phases of floods, they were not filled to the brim." Well at least they're moving in the right direction. The earth is replete with canyons running off to the coast on every continent, a sure sign of the ONE global flood that happened on earth about 4300 years ago. One has only to look at the recent history of Mount St. Helens and the formation of canyon there to verify that canyons form rapidly, not over millions of years as people would like to believe, contrary to common sense.